This past summer, I started growing fresh herbs in pots. I recently moved them inside and hope to keep them going through the winter (fingers crossed!) Because I have fresh herbs at my fingertips, I have been looking for ways to use them. Today I am making Shortcut Tortellini Alfredo for dinner and wanted a scrumptious bread to go along with it. I found the original recipe here but it needed a little tweaking. As it was baking, the bread smelled phenomenal, but that was nothing compared to the mouth watering aroma once I cut into the loaf. I served the bread warm, but it will also be good cooled and used for sandwiches or reheated for a few seconds in the microwave. Both my husband and two year old loved the bread and ate it with butter, but for you calorie watchers out there (like me), it is also good plain and is good for sopping up extra alfredo sauce. Yum! Stir together yeast, sugar, and the warm water in a bowl . Let stand until foamy, about 7 minutes. 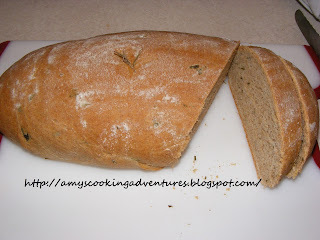 Add 3/4 cup water, the olive oil,salt, chopped herbs, all-purpose flour, and the whole-wheat flour to bowl. Stir until dough comes together. Turn out onto a lightly floured surface and knead until dough is smooth and elastic, 8 to 10 minutes. Lightly oil a large bowl. Shape dough into a ball, and transfer to oiled bowl. Loosely cover with a damp towel. Let dough rise in a warm, draft-free spot until doubled in bulk, about 1 hour. Punch down the dough; let rest, covered, 15 minutes. Turn out dough onto a lightly floured surface. Shape into a loaf. Transfer to a baking sheet. Loosely cover baking sheet with a damp towel, and let loaf rise slightly in a warm, draft-free spot 30 minutes. Meanwhile, preheat oven to 400 degrees. Dust loaves with a teaspoon of all-purpose flour. Press whole rosemary leaves in, if desired. Bake until golden, about 30 minutes. Cool completely or serve warm. It is absolutely delicious and very aromatic!! !